Chelsea are already 11 adrift league leaders Man City and can't afford to lose more groud when they welcome Newcastle at Stamford Bridge on Saturday. Find here how to get a tasty 25/1 Chelsea to beat Newcastle at Ladbrokes! Promo code: BLUES. Chelsea have won 5 of their last 6 matches in Premier League and have a good record against the Magpies. They have won their last 4 home matches against Newcastle in all competitions. Fancy Chelsea to win? - back 25/1 Chelsea to beat Newcastle via this page! Join Ladbrokes via our special links and claim 25/1 for Chelsea to beat Newcastle! 3) Place a single bet of up to €/£1 on Chelsea to beat Newcastle in the 'Match Winner' market before the kick off. 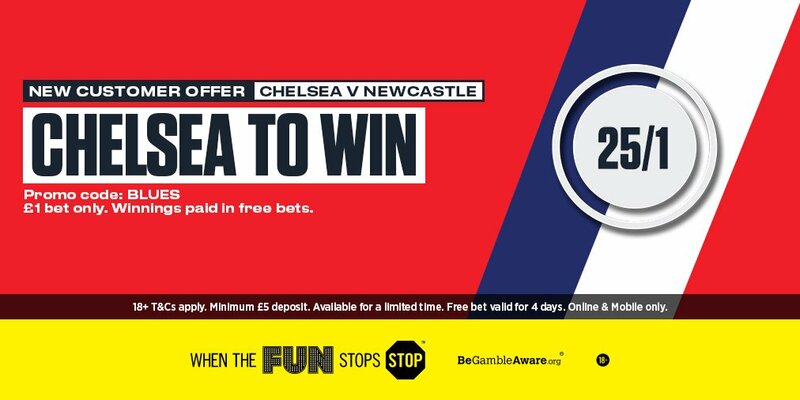 Offer available to new Ladbrokes Online & Mobile customers: Simply register today using promo code BLUES, deposit a minimum of £/€5, and place your first bet as a single bet of £/€1 on Chelsea to win against Newcastle (25/1). This offer is available from 08:00 Thursday 30/11/17 until kick off (12:30) on Saturday 02/12/17. "Claim 25/1 Chelsea to beat Newcastle at Ladbrokes (Premier League offer - 2.12.2017)"